Anze Kopitar skated at the Los Angeles Kings' training complex Monday with a brace on his sprained right knee, reporting no problems in his comeback from the recent injury. The Kings' high-scoring centre still is unlikely to play in the defending Stanley Cup champions' banner-raising season opener against Chicago on Saturday, but might not miss much more time. "To be honest, I didn't know what to expect," Kopitar said. "It felt good, and we'll see day by day how I progress." Kings coach Darryl Sutter was encouraged by Kopitar's post-practice return to the ice just nine days after getting hurt in a collision on the boards while playing for Mora IK in Sweden. Kopitar skated with coaching consultant Bernie Nicholls, shooting a few pucks with no obvious limitations. "I didn't go all-out right off the hop," Kopitar said. "Just curious to explore the turns and stuff, and I didn't have any problems. I thought it would be a little worse than it was. ... I'm very optimistic. It's in my nature." Kopitar has been the Kings' leading scorer in each of the past five seasons, with a career-high 51 assists among his 76 points last year. The seventh-year pro was the NHL's top playoff scorer last summer with 20 points, tied with linemate Dustin Brown. Kopitar played alongside his brother, Gasper, at Mora IK, and Anaheim Ducks forward Bobby Ryan also joined the team later in the NHL lockout. 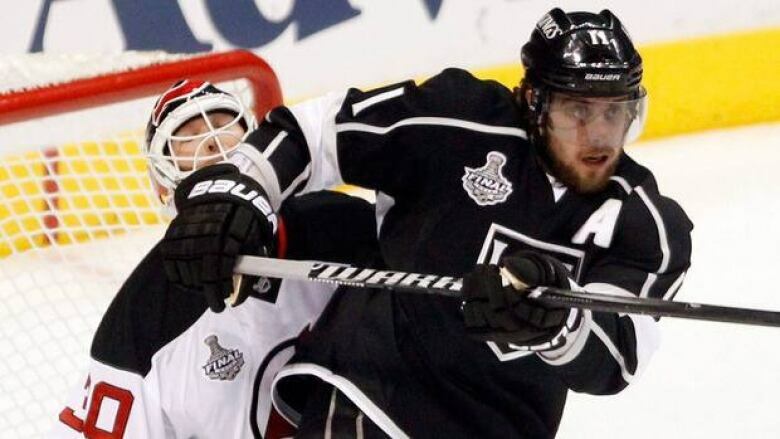 Although the injury probably will deprive Kopitar of the chance to celebrate the Kings' championship on the ice this weekend, he's still glad he played during the labour stoppage. "No regrets whatsoever," Kopitar said. "I've been hit plenty of times when it looked way worse, and nothing happened." The Kings improbably managed to keep together their entire roster from last season's Cup run until Sunday, when they traded little-used enforcer Kevin Westgarth to Carolina for Anthony Stewart, who skated with his new teammates Monday. But Los Angeles likely will be missing at least two key components when the first Stanley Cup banner goes in the Staples Center rafters. "One of the reasons that we won the championship last year is ... the lineup that we were able to use from the middle of January on was pretty much intact," Sutter said. Veteran defenceman Willie Mitchell had knee surgery in the off-season and still isn't back to full strength, forcing the Kings to dig into their defensive depth. The Kings aren't sure when Mitchell will be ready to return. But Jonathan Quick, the Kings' Conn Smythe Trophy-winning goalie, appears to be in top shape after off-season surgery to repair a disk problem in his back. The injury caused pain for Quick whenever he wasn't on the ice during Los Angeles' championship run last season, but the timing of his off-season surgery allowed him to work with the Kings' medical staff during rehabilitation this fall. "They didn't push me if I was in any pain, and the trainers and doctors did a great job," said Quick, a Vezina Trophy finalist last year. "I'm back to 100 per cent."